Soliving: Visual Studio 2013 U1 Lightswitch – March 2014–Can’t create project (.lsxtproj) is not supported. After updating the SQL Server Data Tools in Microsoft Visual Studio 2013, creating a LigthSwitch project will result in an error: ‘…\Application1.lsxtproj’ cannot be opened because its project type (.lsxtproj) is not supported by this version of the application. To open it, please use a version that supports this type of project. I installed everything regarding the SQL Server Data Tools and after restarting Microsoft Visual Studio 2013, I could create a LightSwitch project again. On my development machine: “Micrososft Office Developer Tools for Visual Studio 2013 – March 2014 Update” is installed. Solving: Found conflicts between different versions of the same dependent assembly. I was getting the warning: C:\Windows\Microsoft.NET\Framework\v4.0.30319\Microsoft.Common.targets(1546,5): warning MSB3247: Found conflicts between different versions of the same dependent assembly. The was caused by the referenced assembly System.Net.Http. I was getting the error “Metadata file could not be found” in Microsoft Visual Studio 2013, normally I would clean the solution and build the projects in the correct order manually, but that did not fix the problem. After removing the *.suo file, (with the same name as the solution) the problem was resolved. Fix: Unable to delete file "…". Access to the path ‘…’ is denied. I was getting a build error: “Unable to delete file "…". Access to the path ‘…’ is denied.”, when building a solution in Microsoft Visual Studio 2013.
rd /s /q (to remove all file from the debug folder). How to simply compare two tables on different SQL Server instances. I restored a backup of a database on a different SQL Server instance running on the same server and I wanted to compare data in a table found on SQL Server Instance 1 with the same table on SQL Server Instance 2. 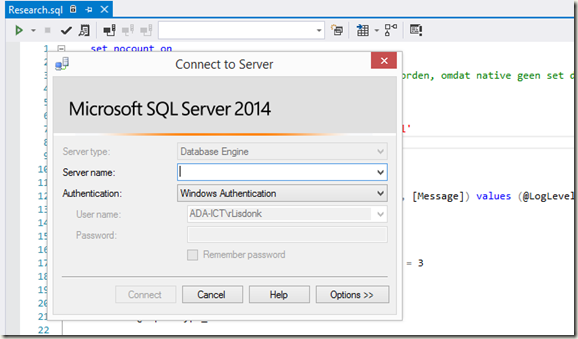 Fix: Could not connect to a SQL Server 2014 instance from within Microsoft Visual Studio 2013. 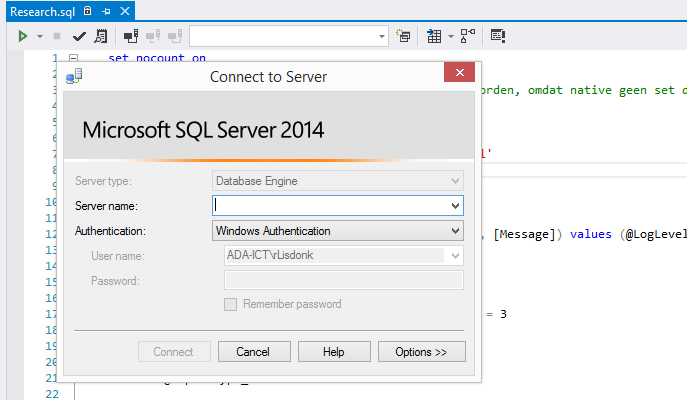 I installed SQL Server 2014, but from within Visual Studio 2013 I could not connect to the newly installed instance. 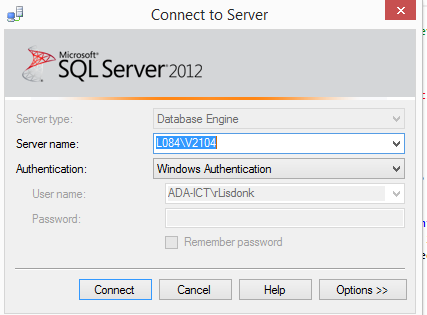 After installing the update, I was able to connect to a SQL Server 2014 instance from within Microsoft Visual Studio 2013. After the installation of SQL Server 2014 was almost completed on a Windows 8.1 workstation, I got the error: "Could not find the Database Engine startup handle". This was caused by the fact, that I used all standard settings during installation. 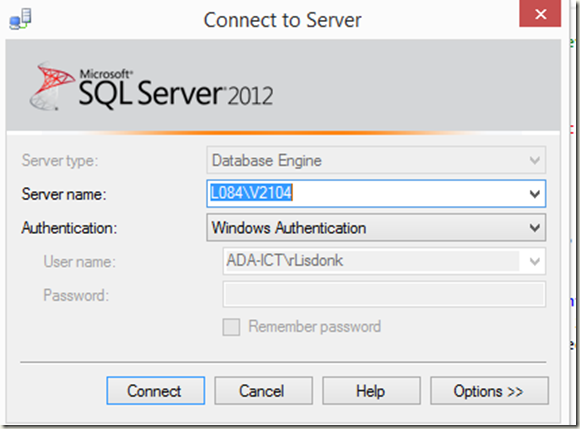 When you choose all to install SQL Server 2014 with all default options, the SQL Server windows service will run under the NT Service\MSSQL$V2014 account, after changing this login to a correct login (a local admin account on the box) the service started correctly and I could login to the SQL Server 2014 instance. // The "main" entry point for this application. // "Winter time" refers to "standard time". // "Summer time" refers to "standard time" + 1 hour. // Time changes at sunday [2014-03-30: 02:00:00.000]. Changes to [2014-03-30: 03:00:00.000]. // [getTime()], returns the number of milliseconds since [1970-01-01 00:00:00] (winter / standard time). // Or just use moment.js!!! !